One cloudless night, a fox falls to earth and comes across a family of humans. As the seasons change and they move their camp, she follows them, growing ever more intrigued by human ways—and especially by the oldest son, Irniq. When Irniq grows older and sets out hunting on his own, he is surprised to enter his tent one day and find the lamp lit, the tea made‚ and a strange woman who says she is his wife. Tired of being alone, Irniq welcomes the woman. But soon he grows curious and cannot stop himself from asking too many questions. 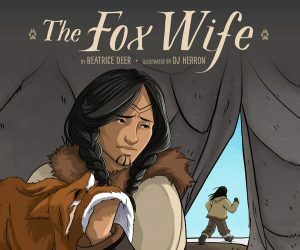 Based on award-winning musician Beatrice Deer’s powerful song Fox, this graphic novel reinterprets a traditional Inuit story for a new generation.